I have to say I use the buses more than the Tube when I'm in London, but the Tube is indispensable when you need to cross town quickly. The Overground was something I hadn't used previously but on our recent trip it was useful on several occasions heading to the Horniman Museum in Forest Hills, The Mayflower pub in Rotherhide as well as coming and going to London City Airport. The Overground is just more comfortable than the Tube, I loved the modern quiet carriages and the wonderful views of London. Don't overlook it when you're planning a trip. The photograph above was take from the Hoxton Overground station looking back towards the city. You can use the Transport for London app to navigate public transport but we used City Mapper, I prefer the interface and I highly recommend it. It's a great app that estimates the journey giving you lots of options including the best option if it's raining. They even have an amusing estimate and animation for a teleport and catapult routes! Having City Mapper opened up London. I felt quite confident about changing buses as it told me how many stops there were and how long the walk would be on both ends. It was incredibly accurate in estimating when the next bus would arrive, and all the data charges were free because we were using our T-Mobile plan. What was great was that it worked well in Berlin though they don't support Helsinki yet! On a rainy day in May I took London Walk's "Underground Walk" which is a great thing to do when it's miserable outside, as it often is in London! I enjoyed learning about the early history of the Tube and the development of competing suburban railways lines, driven by the expansion of housing. Although it was touched upon, I would have enjoyed learning more about the architecture and design of the stations. 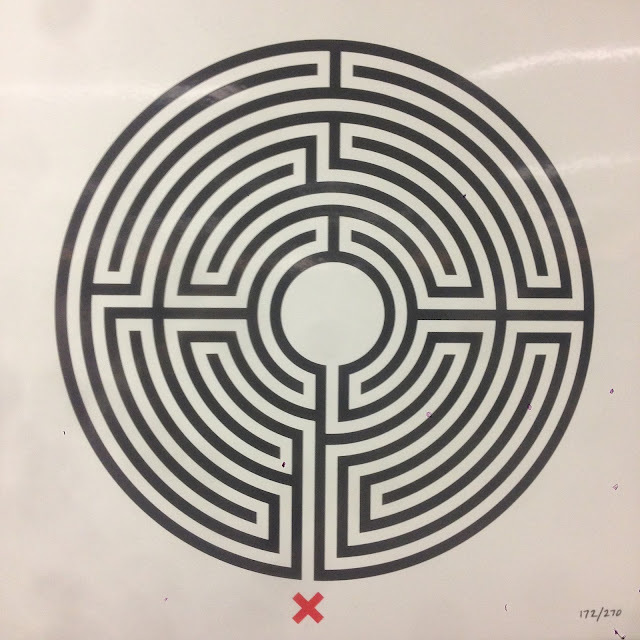 You may recognize the Labyrinth above, Mark Ballinger's designs are found in all 270 Tube stations. Each one is unique and they were commissioned to mark the 150th anniversary of the Tube. It even has its own tumblr page run by a dedicated fan! On the tour we also stopped at the Westminster Station which has undergone an extensive renovation for the Jubilee Line extension. As you can see the whole place has a very Fritz Lang "Metropolis" feel. It's a real contrast to the iconic "oxblood" tile work station facades designed by Leslie Green of which Covent Garden is an excellent example below. So, if you are London why not look more closely at the Tube, the tile work, the entrance, the signage and possibly even the public art. Baker Street Station is a great place to see the history as this was one of the original Metropolitan Railway stations opened in 1863. Tip: Everyone is going to tell you the same thing, even if you are in London for a quick visit you need to get the all purpose Oystercard. Yes you have to pay a five pound deposit but it's refundable and the fares are much cheaper, plus you'll need it because can no longer buy a ticket on the bus. The only reason not to get the oyster is if you are buying a one day travel cardto take advantage of the 2 for one train deals, more info here.